Well, it happens to be 17/2, and it’s also a Friday, so here is a 1:72 French car! 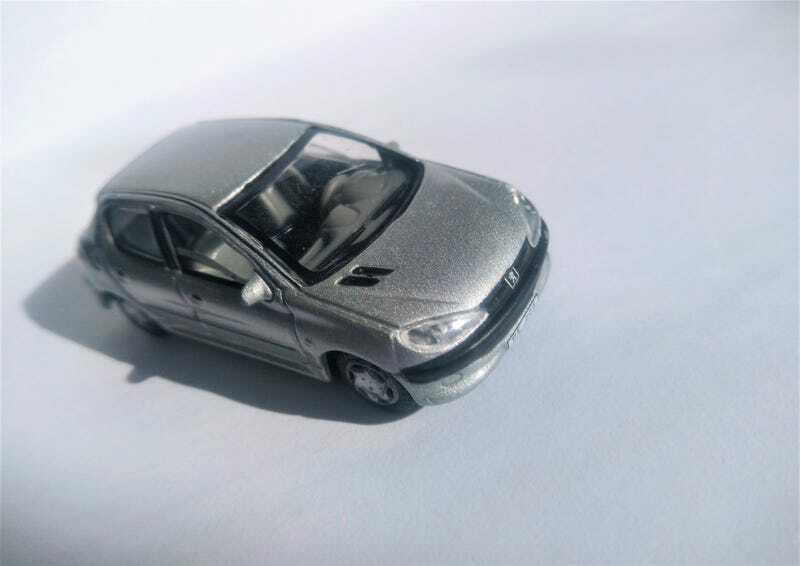 The Peugeot 206 was a lineup of subcompacts/superminis launched by Peugeot in 1998 for the 1999 model year. Hatchback versions were offered first, and hardtop convertible, sedan, and wagon versions were launched later. Engines ranged from 1.0L to 2.0L in gas/petrol and diesel forms. The 206 was supplanted by the 207 in 2006, but the 206 continued production in various countries around the world, and was facelifted and marketed in some countries as the 206+ or, confusingly 207 (but unrelated to the new 207). The 206 WRC, which has been covered on LaLD before, was launched in 1999 and competed successfully from 1999-2003, winning the manufacturer’s title from 2000-2002. This example is from Hongwell, whose diecasts are often marketed under the Cararama nameplate. Their 1:72s are surprisingly detailed, with headlight lenses and painted door handles, bumpers, windshield wipers, and window surrounds. Interiors are also well done, with sharp seat texture, well-shaped headrests, dashboard, and a spoked steering wheel. Underbody detail is also excellent, with suspension and exhaust components molded in. I believe I purchased this example new a few years ago when Hongwell was the contracted manufacturer for Toys R Us’ in-house Fast Lane line, and these 1:72s were sold in 3-packs.